Sometimes it seems like Parkinson’s Research is a bit like Target Practice. If you try to come at it from a lot of different angles, eventually something is going to hit the bullseye. 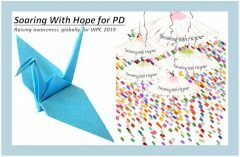 It is almost impossible to keep up with all of the different research projects looking for a cure or even just a way to slow down and stop the progression of PD. Some examples from this past week alone include fish that sense magnetic fields, effect of different frequencies of DBS on gait, and chaperone proteins. Huh? Someone please interpret!!!! This study from Michigan State University (MSU) : A fish that can sense the Earth’s magnetic field while it swims could help scientists understand how the human brain works and eventually unlock strategies to help control movement impairments in patients with Parkinson’s disease and other neurological disorders, a study reports. Low-frequency subthalamic deep brain stimulation (STN-DBS), but not high-frequency STN-DBS, reduces freezing of gait in Parkinson’s patients while preserving their ability to simultaneously process motor and cognitive information, a recent study shows. The study, “Decreasing subthalamic deep brain stimulation frequency reverses cognitive interference during gait initiation in Parkinson’s disease,” was published in the journal Clinical Neurosphysiology. Low levels of a specific chaperone protein might be implicated in the development of Parkinson’s disease and Lewy body dementia, according to new research at University of Alabama at Birmingham. Researchers investigated the role of a protein called 14-3-3θ — a type of protein that can assist other proteins to assume a proper shape. “The study suggests that 14-3-3θ may be a suitable target for efforts to slow the progression of neurodegenerative diseases, although more work is needed,” according to Talene Yacoubian, an MD and PhD, associate professor in the Department of Neurology at UAB. by fellow WPC blogger Tim Hague. He tells his fascinating story of growing up as a bi-racial child in a large, warm adoptive family, his Parkinson’s disease, how he and his son, Tim, Jr. got into The Amazing Race Canada (Season 1) and finished in first place, and more. I really enjoyed the book and finally met Tim last week at the Davis Phinney Victory Summit in LA. Well done, Tim! And in the “what was I thinking department“, Mr. Twitchy and I went to the Fox Foundation’s Parkour 4 Parkinson’s event in LA a few weeks ago. I am not sure what got into me, but I had to try the course. According to PD Ninja, Jimmy Choi, there were only 4-5 of us Parkies there who actually tried it. Mostly it was agile kids and teenagers having a great time. (watch for the young girl behind me on the ropes). I should have known better, but once I was there, any brain cells that I still have left apparently forgot that I am not in Middle School. Here is the video that Mr. Twitchy took of my attempt at being a Ninja Warrior! For what it’s worth – You titled the video “The American Ninja Fail” But I don’t see that. What I see is someone leaving their comfort zone to try new things. Why is that important? Well, as you know living with PD, our challenges are constantly changing. If things aren’t “working” anymore or you are having trouble completing tasks, and yet you don’t try to find new ways to get them done, then you will never improve. You may try new ways and still have difficulty but you will NEVER find a way around the obstacle if you don’t try. Your efforts and willingness to try despite how uncomfortable it made you, makes this a success in my book. I want all PWP’s to take your example and try new ways to do the same things we do each day. Remember, taking 5 extra turns to go in a straight line is better than taking no turns and never getting to the destination. Cheers Sharon. Thanks for the inspiration today.